THE world’s top medical technology companies are turning to robots to help with complex knee surgery, promising quicker procedures and better results in operations that has often left patients dissatisfied. Doctors and medical staff work during knee prosthesis surgery in an operation room at the hospital of the Canton of Nidwalden in Stans, Switzerland. 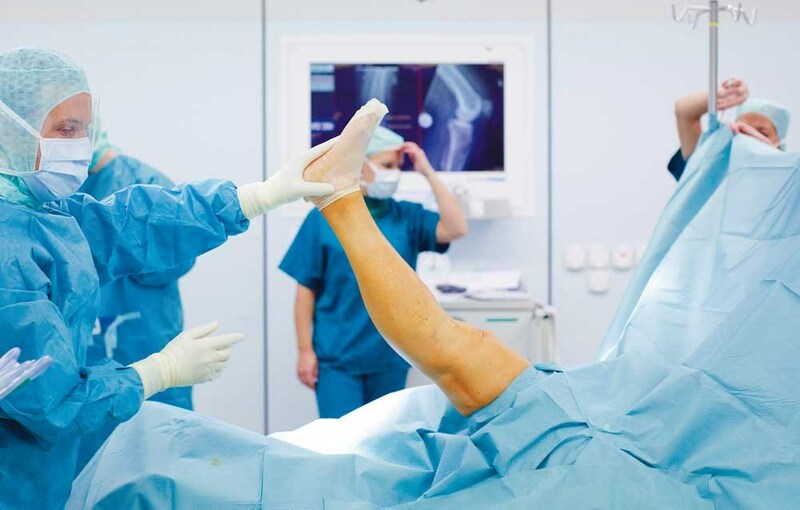 Demand for artificial replacement joints is growing fast, as baby boomers’ knees and hips wear out, but for the past 15 years rival firms have failed to deliver a technological advance to gain them a significant market share. Now US-based Stryker and Britain’s Smith & Nephew, believe that is about to change, as robots give them an edge. Robots should mean less trauma to patients and faster recovery, although they still need to prove themselves in definitive clinical studies, which will not report results for a couple of years. Fares Haddad, a consultant surgeon at University College London Hospitals, is one of the first in Britain to use the new robots and he has been impressed. However, he agrees healthcare providers need decisive data to prove they are worth an investment that can be as much as US$1 million for each robot. Satisfaction rates are only around 65 percent for knee operations, against 95 percent for hips, according to industry surveys. The rival types of robots vary in cost and sophistication, assisting surgeons with precision image guidance for bone cutting and the insertion of artificial joints. Orthopedic companies hope to emulate the success of Intuitive Surgical, an early pioneer of robots in hospitals, which now has more than 4,000 of its da Vinci machines installed around the world for procedures including prostate removal, hernia repair and hysterectomies. In addition to selling into big Western markets, they also want to expand robot use in India, China and other emerging markets, where owning a prestigious high-tech system can be a marketing advantage for private hospitals. Stryker is leading the charge with its MAKO robotic arm, a platform it acquired for US$1.65 billion in 2013 and which has pioneered robot-assisted whole-knee operations by determining optimal positioning and then helping with bone cutting. But it has competition from smaller rival Smith & Nephew, which last week launched a cheaper product called Navio for total knee replacements in the United States. The British group bought the company behind Navio for US$275 million in 2016. That has kicked off the battle in earnest, since both companies are now able to do total knee replacements, which represents the vast majority of knee procedures. MAKO, which uses only Stryker’s joints and implants, costs around US$1 million to install, while Navio, which does not have as many features and is not tied exclusively to Smith & Nephew’s products, is less than half the price. Both companies believe their robots will help them capture a bigger share of an orthopedic market that has been split between four big players for more than a decade. Indeed, Smith & Nephew’s Chief Executive Olivier Bohuon said it was his company’s most important strategic investment for a decade. Stryker, meanwhile, expects its MAKO system to start delivering market share gains from the end of 2017.
Zimmer Biomet and Johnson & Johnson (J&J), the two other big players in orthopedics, are lagging in the robotics race but both have plans to enter the area in different ways. J&J is working on surgical robotics with Verily, the life sciences arm of Google parent Alphabet, while Zimmer last year bought a majority stake in France’s Medtech, a specialist in neurosurgery. Analysts at Morgan Stanley believe robots have the potential to disrupt a market in artificial joints that has arguably become commodified, with no knee or hip implant emerging as supreme in recent years. That chimes with the view of Smith & Nephew’s Bohuon, who argues that robots give his company a chance to punch above its weight, despite ranking No. 4 in reconstructive surgery. He reckons robotics could account for 20 to 40 percent of knee operations. Much will depend, however, on how the rival systems stack up. Jefferies analysts said the semi-automated bone resection offered by MAKO might well win out in the long term, but Navio offers a far cheaper option and is still well ahead of anything the other two major manufacturers have today. Brains, eyes, testes: Are there off-limits for transplants?